Pizza Forest is a nightmarishly cheerful 'family' chain restaurant, where people dressed in soulless furry woodland suits sing "ROW ROW ROW YOUR BOAT" at you until you break. 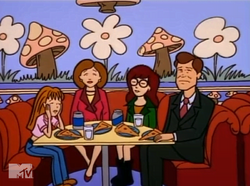 In "Esteemsters", Daria manipulated her parents into taking the family there so they could "suffer" - as they wilted under the singing, Daria encouraged it to continue. From her dialogue, the Morgendorffers had gone to the Highland branch when Daria and Quinn were children, something Quinn recalled with horror. In "Of Human Bonding", we learned Terry Perry Barlow had made $40 million from creating and selling the franchise. In Jane's MTV Web feature Gourmet's guide to pizza pleasure, she gave Pizza Forest two points out of ten and her very worst review: "Annoying people in animal suits just stand there when you hit them with the menu. Pizza tastes like frozen supermarket kind, only worse." A squirrel-suited worker named Phil introduced an MTV flipbook about animals on the show. "Hello. I got roped into introducing this section because I have a crappy job at "Pizza Forest" singing silly songs in an overheated squirrel suit. On top of that, they make me wear lederhosen and the damn beaver can't stay on key to save his life. By the way, my name is Phil and I'm not an animal, dammit, I'm a man. Sort of." Even in fanworks there is no escape, as its memorable scene from "Esteemsters" leads to it making various appearances, especially in alternate universe serials that redo the whole series from the start. Notable twists on this include in "It Slipped Through My Hands, Like a Shadow, Like a Dream", where a developmentally disabled Daria is taken to Pizza Forest by Amy Barksdale and genuinely enjoys it like canon Daria only pretended to; and RX-87's "Esteeming Out The Gutter", where a homeless Daria and Jane are desperate enough and just settle for it. This page was last edited on 27 April 2018, at 18:28.